Update, October 2: EA have launched a new look at this week’s Battlefront II beta, confirming last month’s leaked info. The original isn’t the only Battlefront II making headlines today. EA have revealed a quick glimpse at what to expect from this week’s open beta, and it pretty well lines up with what was leaked a few weeks ago. Maps across all three Star Wars film eras, the ability to get up to space battles, and even split-screen co-op options. Also, it looks real, real pretty. Battlefront 2’s StarFighter Assault mode is the best kind of fan service. The beta will be open for all on Friday October 6 at 1:00 PDT / 4:00 EDT / 9:00 BST / 10:00 CEST. If you’ve bought in on a pre-order, it’ll start at those same times on Wednesday, October 4. 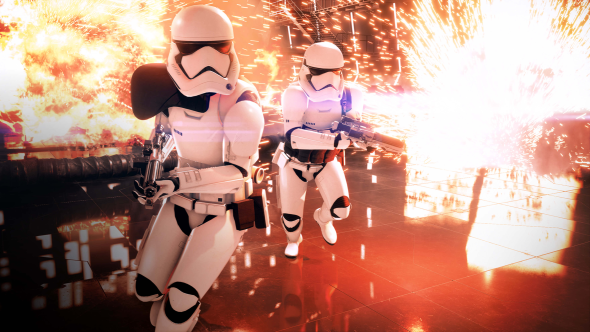 Original Story, September 11:The details for the Star Wars Battlefront 2 beta have been leaked. In a post onReddit, an extensive leak has revealed the game modes and heroes that’ll be available, as well as some extra details about the game. Most of the new information concerns what maps and game modes will be available when the beta is released. Currently, there seem to be four available game modes: Galactic Assault on Theed, a Clone Wars-era battle for the capital city of Naboo; Space Battle on Fondor, an Empire-era battle; Strike on Takodana, which featured in The Force Awakens; and Skirmish mode, which makes its return after featuring in Star Wars Battlefront. That means all three eras will feature in the beta, and you’ll also be able to play in co-op mode. You’ll also get the same four heroes that appeared at E3, which means Rey, Han Solo, Darth Maul, and Boba Fett will all be playable. A new feature coming to the beta will be the introduction of the LAAT vehicle, which will apparently circle its map (probably Theed) much like the U-wing did on Scariff in the first game. The leak also goes into the beta’s logistics. It reveals that you’ll be able to play on PC, PS4, and Xbox One, and that the download will be somewhere between 14-16 GB. There’ll also be a slight graphical improvement over what we saw at E3. Any credits or other collectibles you earn won’t carry over from the beta to the main game. The Star Wars: Battlefront 2 beta takes place October 6-9, but pre-order players get access on October 4.